Gartner Identifies the Importance of Demand Sensing and Trading Partner Networks for the Future Supply Chain - E2open | Demand. Supply. Delivered. Access Gartner research to learn more. New data sources offer opportunities to improve demand sensing using advanced machine learning algorithms to make sense of large quantities of retailer, social media, weather, and other types of information. Companies should not limit themselves to internal data and should leverage that of their trading partners. 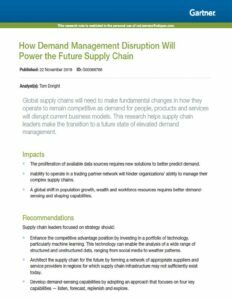 Access this important research to prepare for the future supply chain.